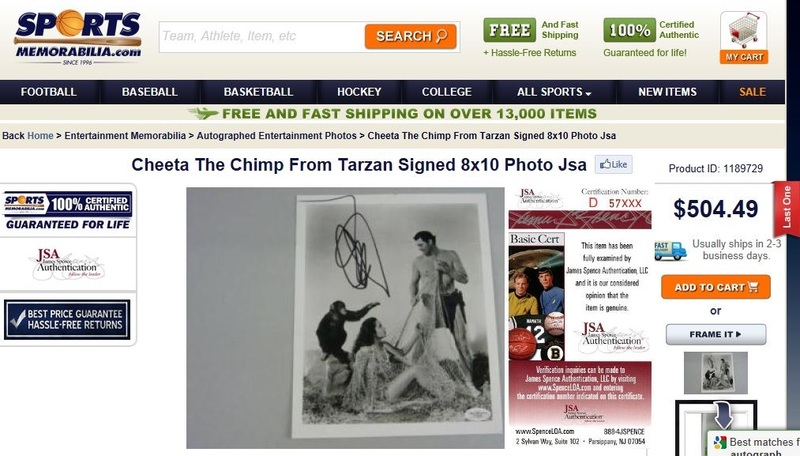 A photo alleged to have been signed by Tarzan star-chimp "Cheetah" is being sold on eBay with a JSA LOA despite the fact the chimp signing was exposed as a fraud in a 2008 Washington Post investigative report. Auction giant eBay is currently offering for sale an 8 x 10 photograph allegedly autographed by the famous chimpanzee “Cheetah” who starred with Johnny Weissmuller in the Tarzan movies of the 1930s and with Rex Harrison in Dr. Doolitle in the 1960s. 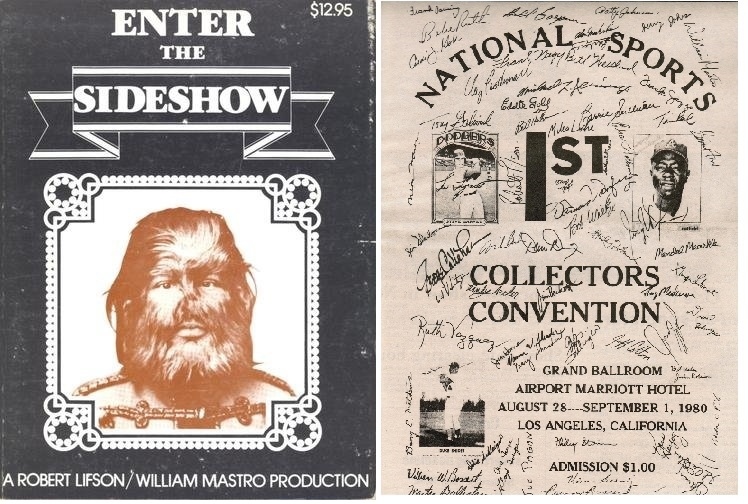 The seller, “presspasscollectibles” indicates that the photo has been authenticated by James Spence Authentication and a JSA sticker is afixed to the lower right hand corner of the glossy photo signed in black sharpie by the famous primate. 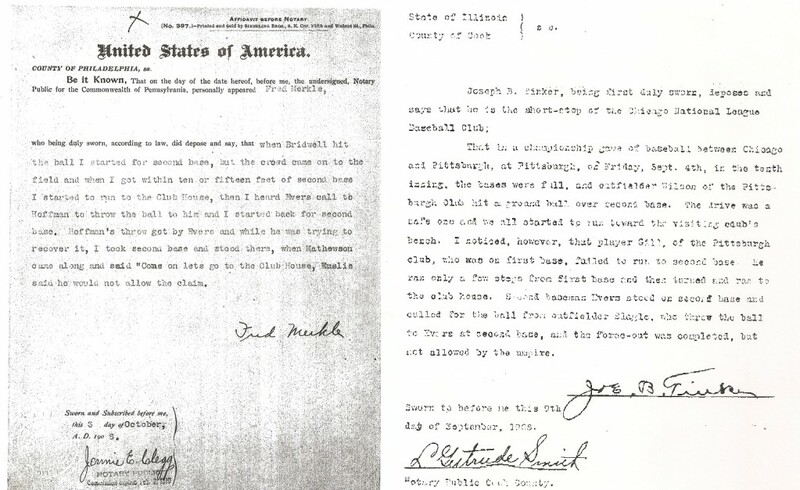 JSA certifies the authenticity of the chimp signature but, in reality, an extensive investigative report published in 2008 by the Washington Post illustrates that the “movie-career” of the alleged chimp owned by Westfall was a fraud and that the primate never starred in any of the Tarzan films with Weismuller. This information has been widely disseminated since the report, “Lie of the Jungle: The Truth About Cheetah the Chimpanzee” was published by writer R. D. Rosen. 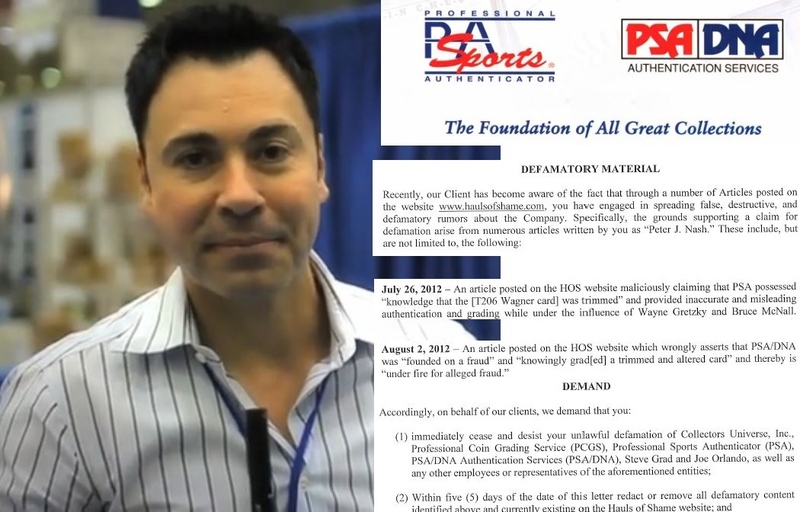 It’s yet another striking example of how JSA authenticates items without examining the actual signatures and issues certificates of authenticity based solely upon the existence of other unverified letters of authenticity and a stories from customers. The chimp alleged to have been the Cheetah of Tarzan fame autographs an 8x10 glossy in an alleged private signing. Despite the fact the photo was never signed by Cheetah the Chimp, the eBay seller assures customers: "Be rest assured that by purchasing this item, you are getting the real deal." Author R. D. Rosen was considering writing a book about the famous chimp but in the course of his due diligence he uncovered overwhelming evidence illustrating that the chimp signing 8×10’s was not the original Cheetah and had never appeared in any Hollywood films. The fraud dated back to the chimps first owner who, on the record, had stated a myriad of conflicting stories related to the chimps personal history which included a story that the chimp was smuggled out on a flight from Africa after filming ended in 1932. Rosen, however, discovered that commercial flights weren’t available until 1939. This scribble was executed by a chimpanzee who was exposed as not being the chimp from the Tarzan movies. 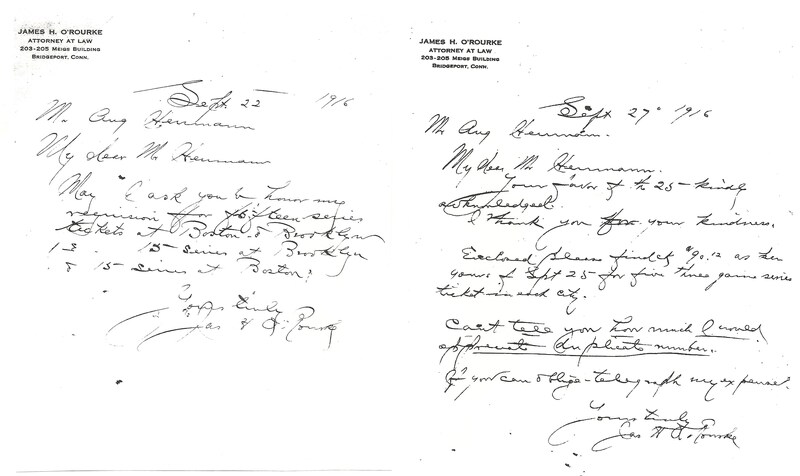 Despite that fact JSA authenticated the signature believing they can actually authenticate the handwriting of primates. Author R. D. Rosen did not respond to our inquiry for comment about JSA’s authentications of the “Cheetah” autographs being sold on eBay. How could JSA ever differentiate between any of the alleged Cheetah signatures that accompany the LOA's issued by the chimp owner. 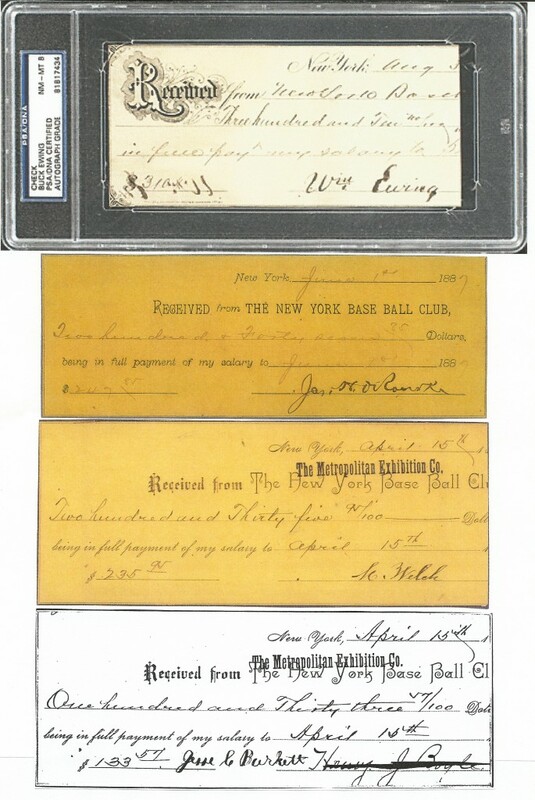 The LOA (center) was offered with a Cheetah sig offered on eBay by seller "collectstars" for $29.99. 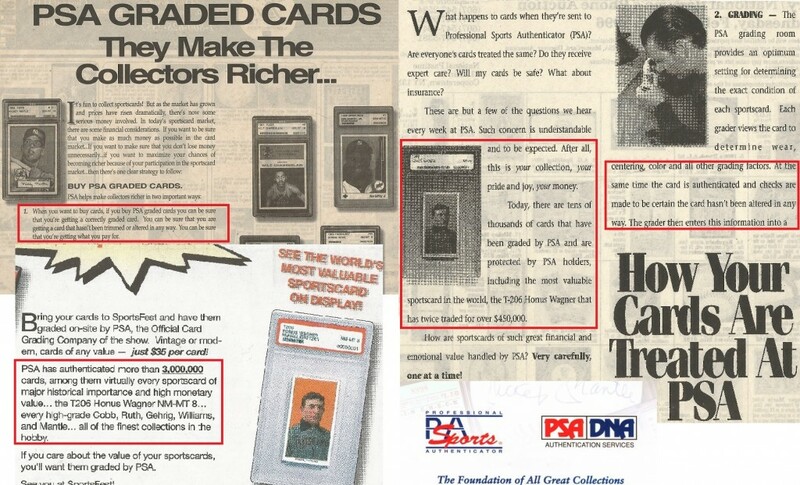 The chimpanzee authentications also illustrate how JSA’s standing as an eBay-approved authenticator helps facilitate the creation of LOA’s which add false values to fraudulent items. 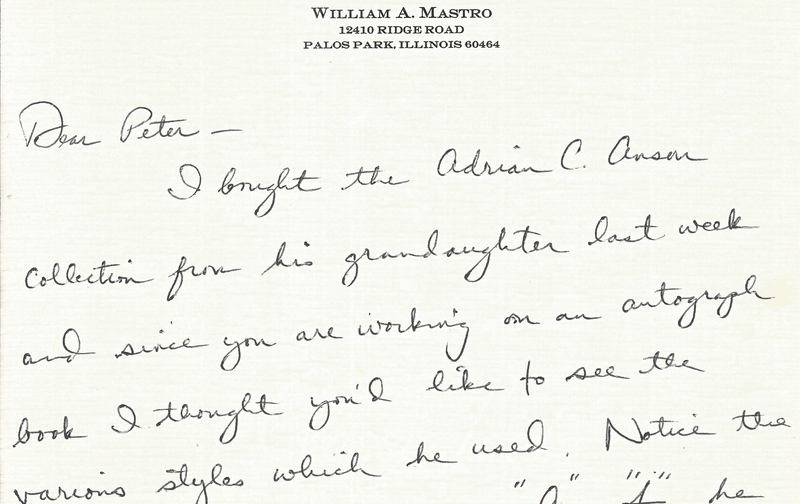 Ebay seller “collectstars” recently offered a similar Cheetah autograph with only an LOA signed by the chimp’s owner and the chimp for $29.99. 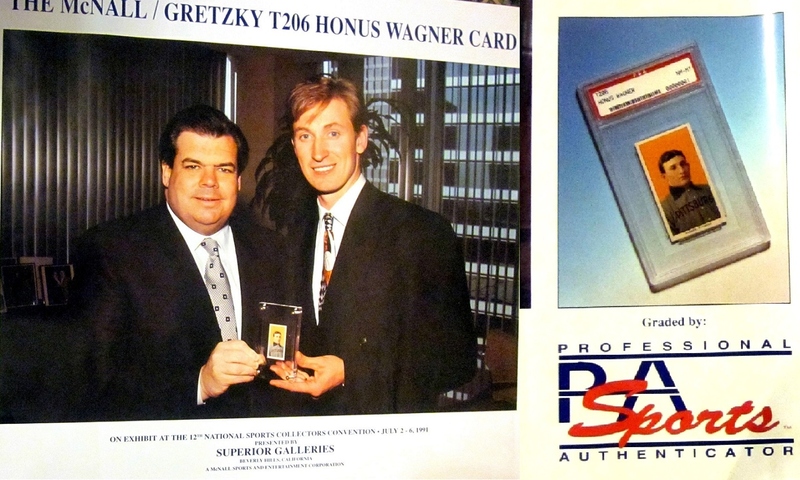 Seller “presspass” offers the same type of bogus chimp autograph with a JSA certification and a Buy-It-Now price of $399. The lack of expertise and authentication malpractice exhibited by James Spence and JSA in this instance has created an illusion whereby an eBay seller tells customers they can rest assured they are getting the “real deal” when, in fact, they are a “But-It-Now” button away from being swindled. 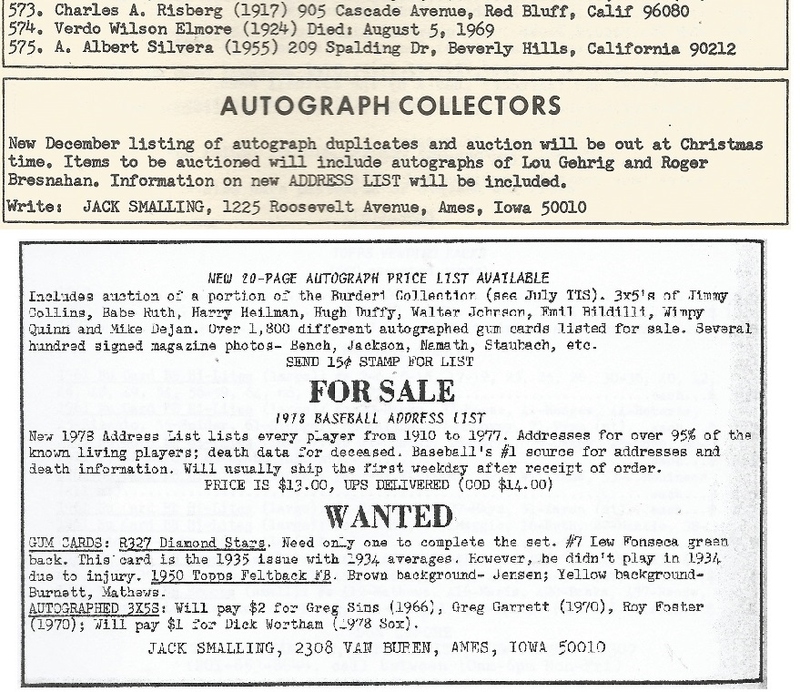 UPDATE (Wed. Sept. 18): Two days after publishing this article about eBay’s offering of the bogus JSA authenticated signed photo of a chimp who never starred in the Tarzan or Dr. Doolitle movies, the eBay listing is still live and additionally the same signed photograph is being offered by another big JSA customer “SportsMemorabilia.com.” for $504.49. The same bogus chimp photo being offered on eBay is being sold for an even higher price at SportsMemorabilia.com. If you have any information about other fraudulent items being offered on eBay let us know at: tips@haulsofshame.com . It took a few weeks, but the autographed photo alleged to have been signed by “Cheetah the Chimp” of Tarzan and Dr. Doolittle movie fame has been removed from the eBay auction site. As reported on September 16, the photo features a chimp who never starred in any movies and was the subject of a Washington Post investigative report by author R. D. Rosen who presented overwhelming evidence illustrating that the Chimp who was being pimped by his handlers as the real “Cheetah” was indeed a fraud. The photograph was authenticated by James Spence Authentication (JSA) despite the fact that the fraud could have easily been documented via a few Google searches. 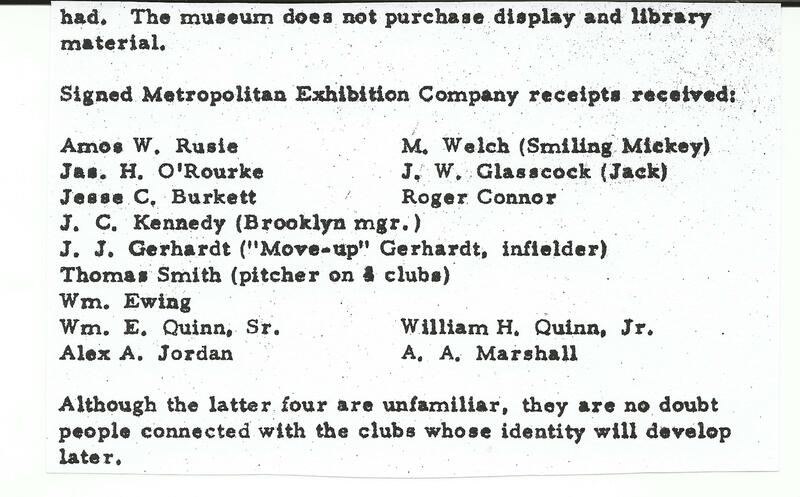 The Chimp fake joins a host of other notable removals of JSA items from the auction site including single-signed baseballs featuring signatures of Biz Mackey, Goose Goslin and Walter Johnson. The JSA-authenticated fake of Cheetah The Chimp was removed by eBay's Fraud Division earlier today. 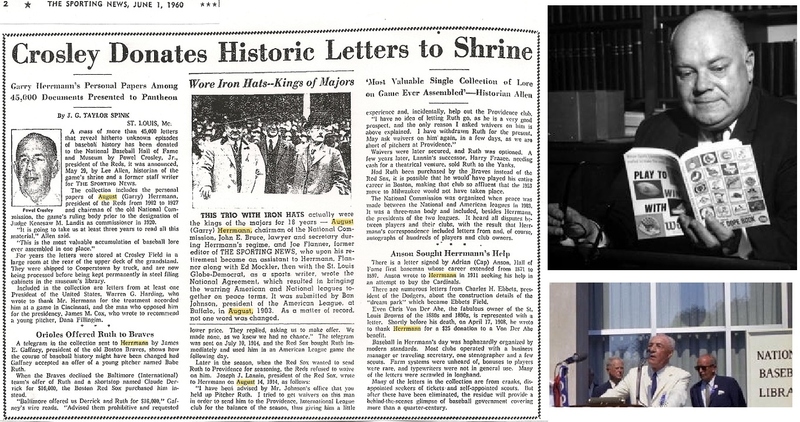 A call to James Spence III of JSA for comment was not returned. 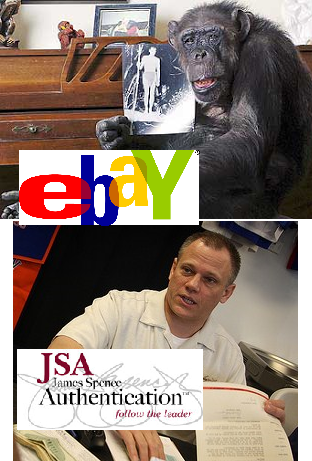 The JSA authentication of the fraudulent chimp photo is another embarrassing blunder by the authentication company eBay considers one of leaders in the industry. 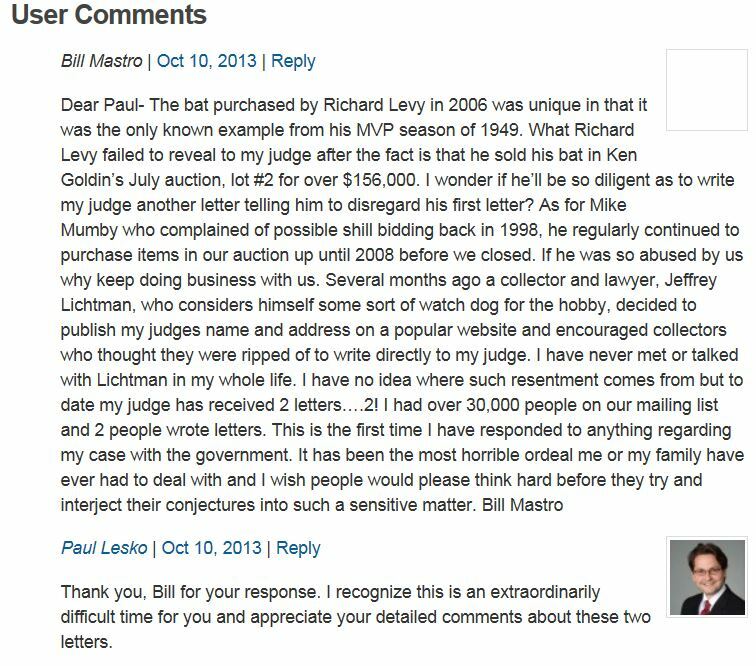 In the past JSA has made serious authentication mistakes ranging from its certification of a misspelled $35,000 Ed Delahanty letter to the infamous Sal Bando video released by a FOX news crew. While the Chimp controversy has provided laughs for many onlookers, Hauls of Shame has been contacted by several people who collected Cheetah material and were disappointed that their alleged Cheetah autographs and paintings were created by a chimp with zero Hollywood-movie pedigree. Most of the Cheetah fakes ranged in price from $100 to $400. Author R. D. Rosen, who exposed the fraud, recently told Hauls of Shame he’s working on a book chronicling his investigation of Cheetah with the working title: Chump. 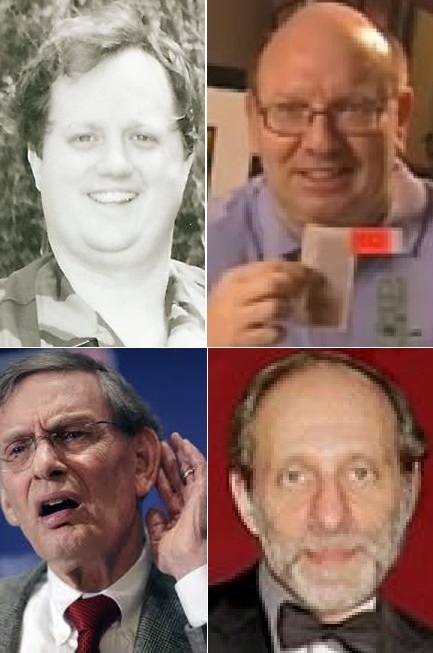 Convicted felon Robert Fraser (top left) is on the loose; Bruce Dorskind (top right) passes away; Bud Selig (bottom left) should buy NYPL docs; Barry Sloate (bottom right) a hobby hypocrite. 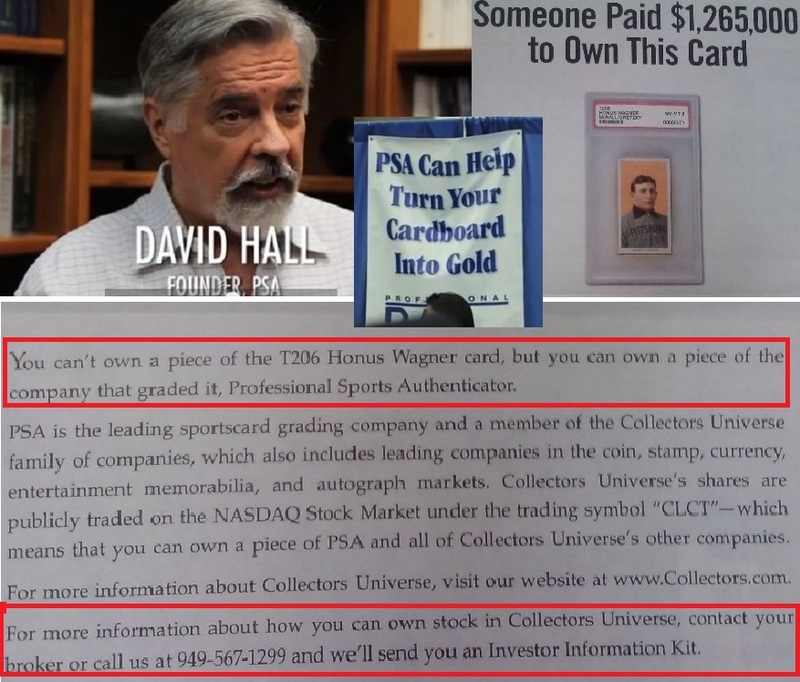 -Whistle-Blowers who have worked for big hobby companies have contacted Haulsofshame.com with the intention of exposing alleged fraudulent business practices of some of the hobby’s biggest players. 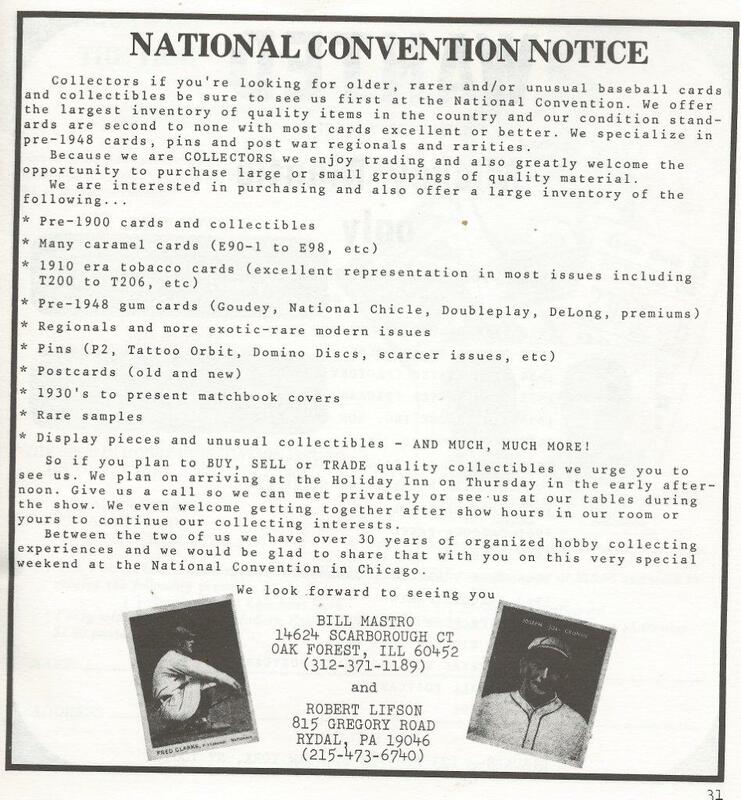 Stay tuned this Fall for our coverage that should be beneficial for collectors and interested law enforcement entities. -Nuf-Ced McGreevy’s treasured photograph of a legendary Red Sox scene was recently recovered by officials at the Boston Public Library. 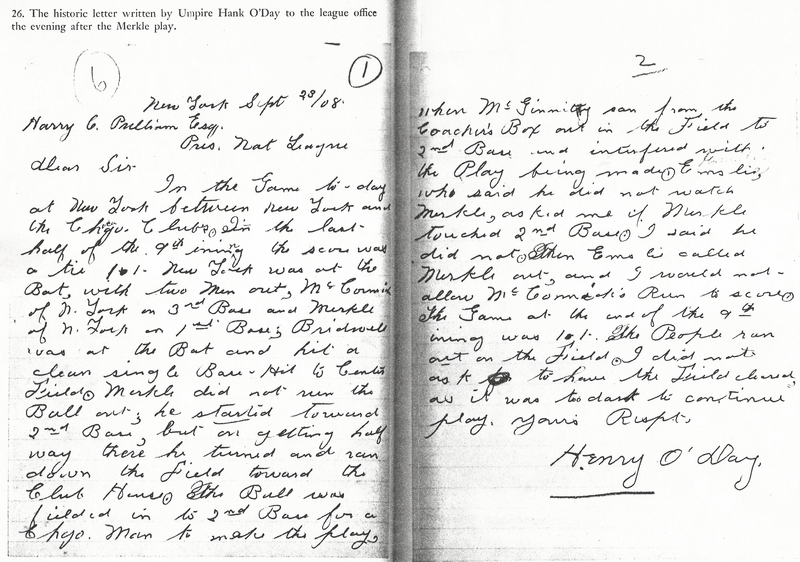 The photo was stolen along with close to one hundred others back in the late 1970s and the library has done a tremendous job recovering McGreevy’s looted treasures all on their own. Stay tuned for in-depth coverage of the recovery this month. 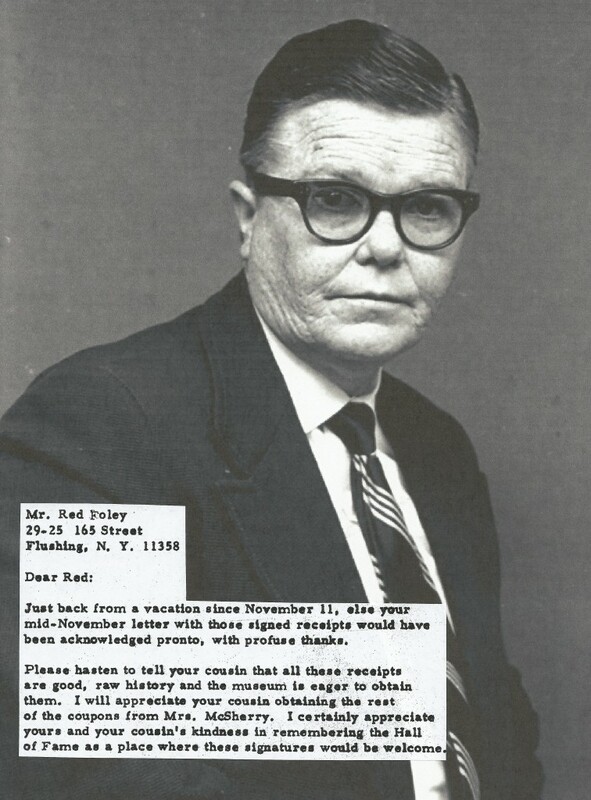 -Barry Sloate thinks Fraser’s slander and fabrications are”amazing.” This coming from Sloate who, in response to an inquiry in 2009 by Freddie McGuire related to the provenance of many dubious items he had sold in the past, stated: “As far as pieces I have sold in the past, I have sold dozens and dozens of rare items and I will admit I do not know the provenance of any of them. 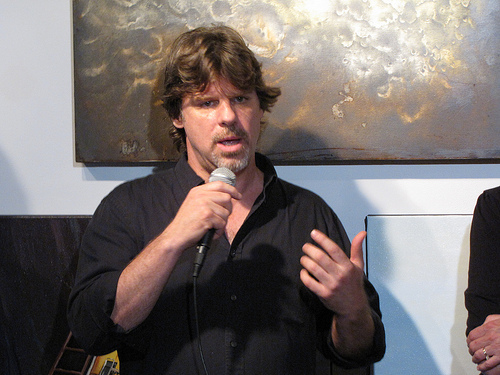 I hope all of them were good but like I said, I do not know their source.” Sloate returned a call from Haulsofshame.com and declined to comment on his past statements and his ties to stolen materials. Sloate, a known cat-lover, may also be interested that Fraser admitted to our source that while pet-sitting for a neighbor’s cat in Westwood, New Jersey, he became agitated with the cat and killed it, drowning it in a bathtub. He’s a real gem. 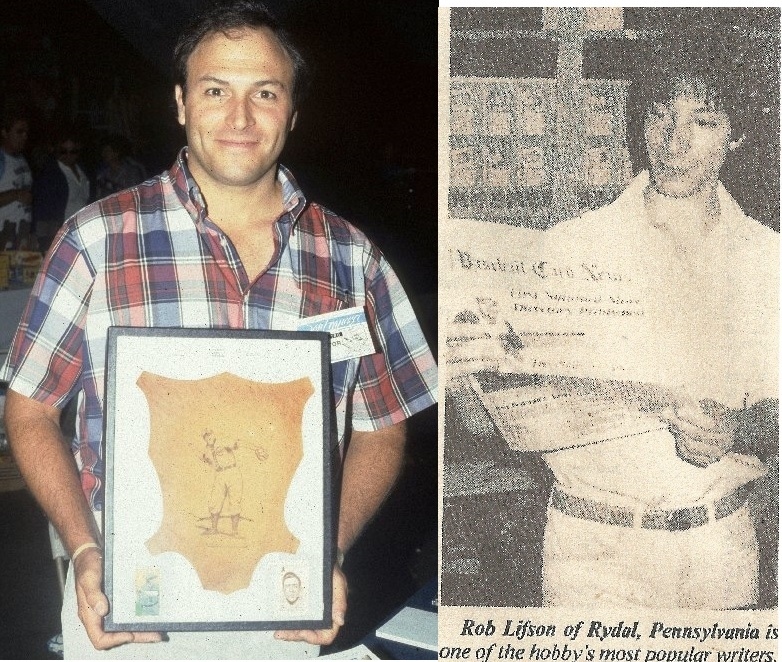 Lew Lipset was told Bruce Dorskind (left) posted bail for Rob Lifson after his NYPL apprehension. 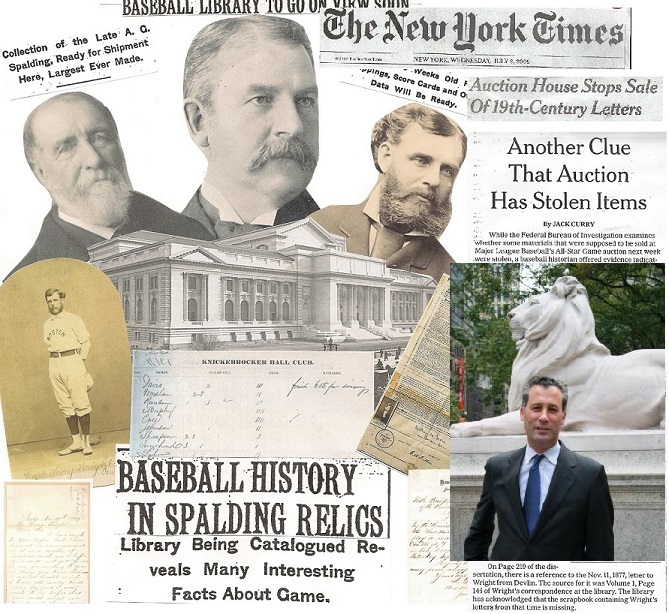 Barry Sloate has owned and sold a myriad of relics stolen from the NYPL including the 1852 Eagle Ball Club By Laws (center) and "Challenge Letters" from the Knick BBC scrapbooks. 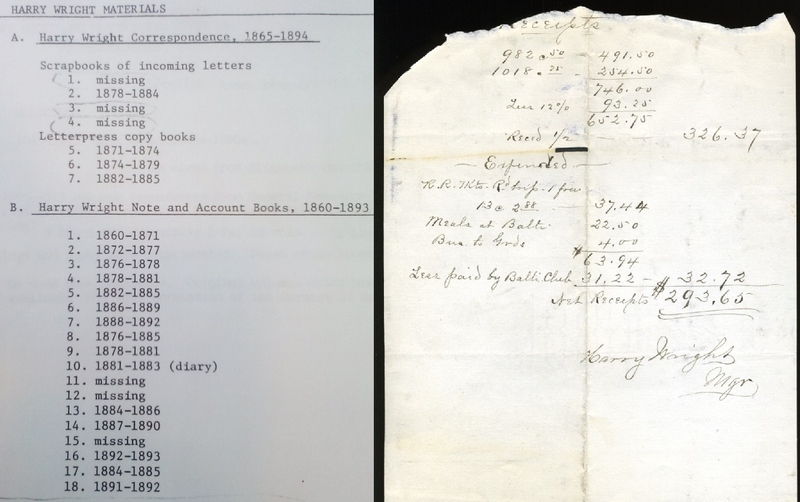 Pictured (right) is the second page of a letter that is still pasted in the NYPL scrapbook. 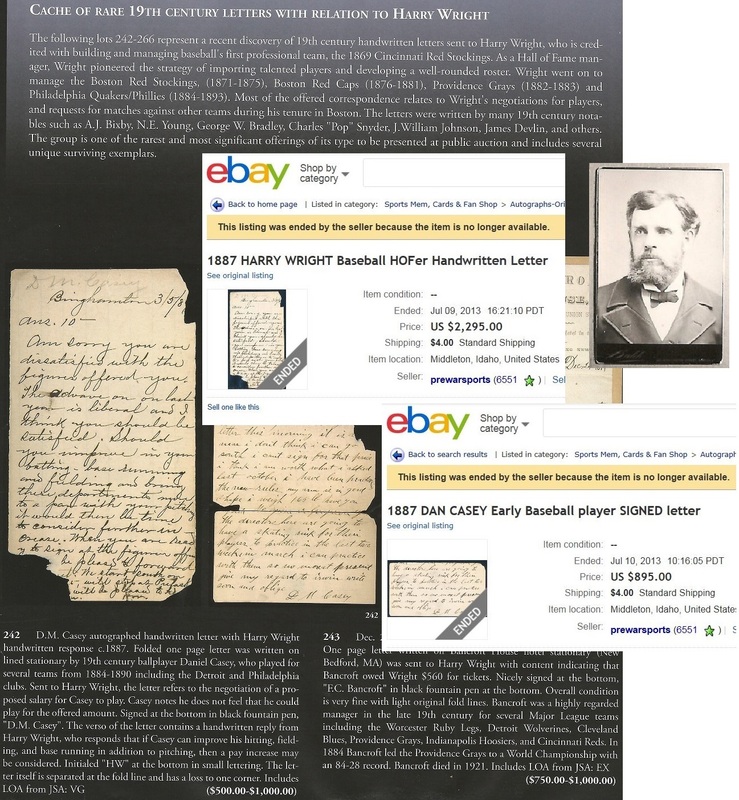 In his 2000 auction, Sloate sold the other half of the May 19, 1859 letter which was stolen with the aid of a sharp object. 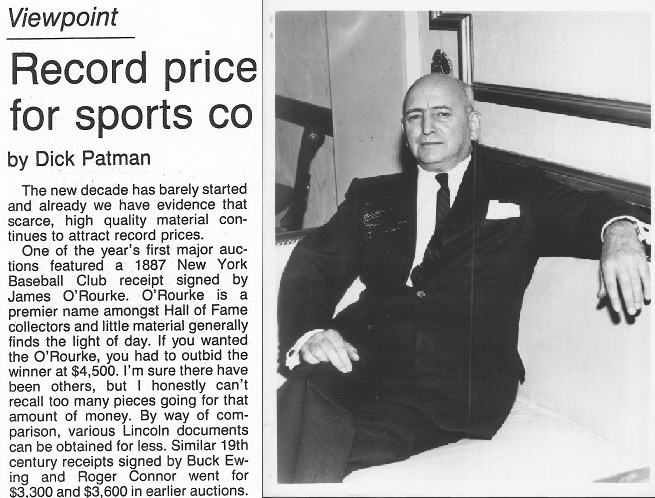 -REA and Rob Lifson are rumored to be the auction house that will ultimately sell-off the Dorskind Collection. REA sold Dorskind’s “Panel of 4 Boston Garter Cards from 1912″ for $177,750 this past May. 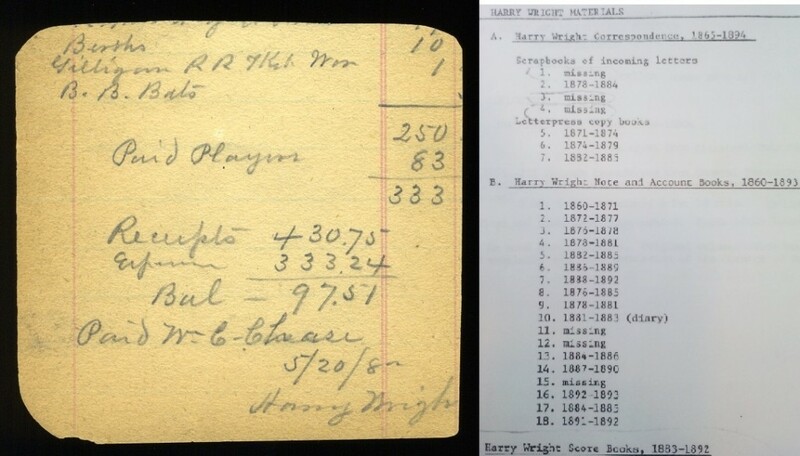 Sources say Bud Selig has a chance to restore the NYPL's stolen Harry Wright letters offered for sale in MLB's 2009 All-Star Game auction. Included were letters from Jim Devlin (right) who was banished from baseball in 1877 for taking part in throwing games. 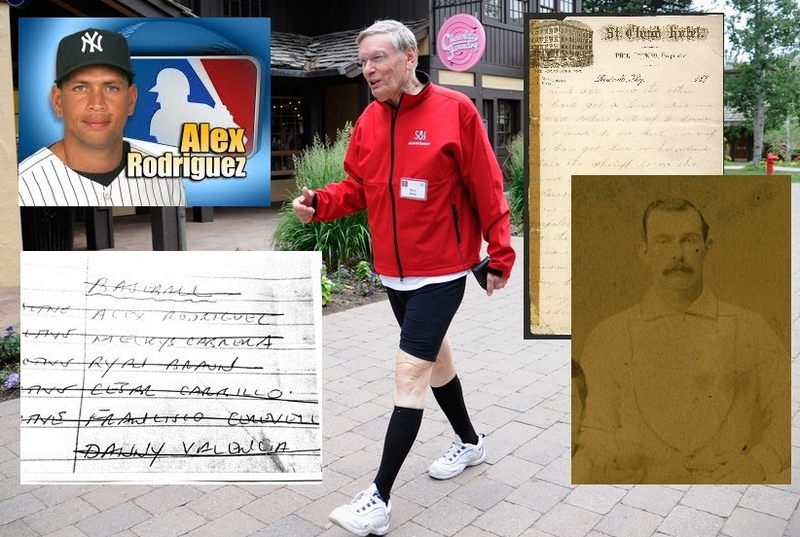 Sources say Selig could purchase these docs from collectors much like he bought the Biogenesis docs (bottom left) in his quest to banish A-Rod (inset). 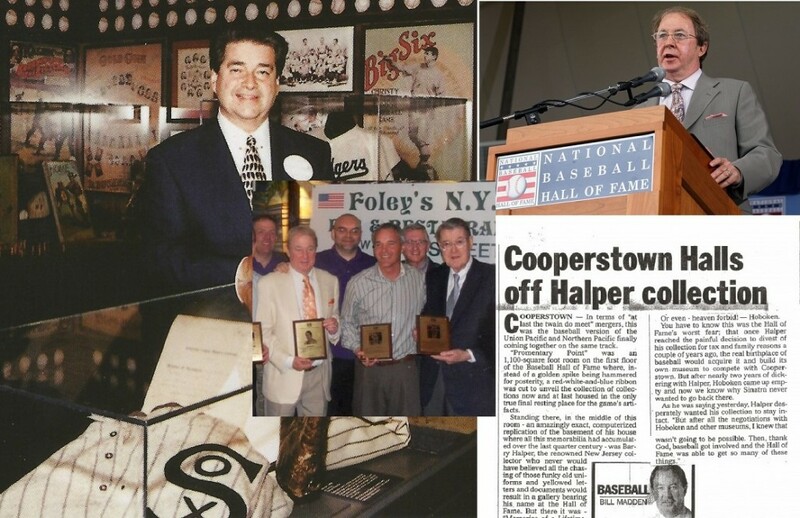 -MLB Commissioner Bud Selig could score some points in trying to restore the Harry Wright Papers to the New York Public Library. 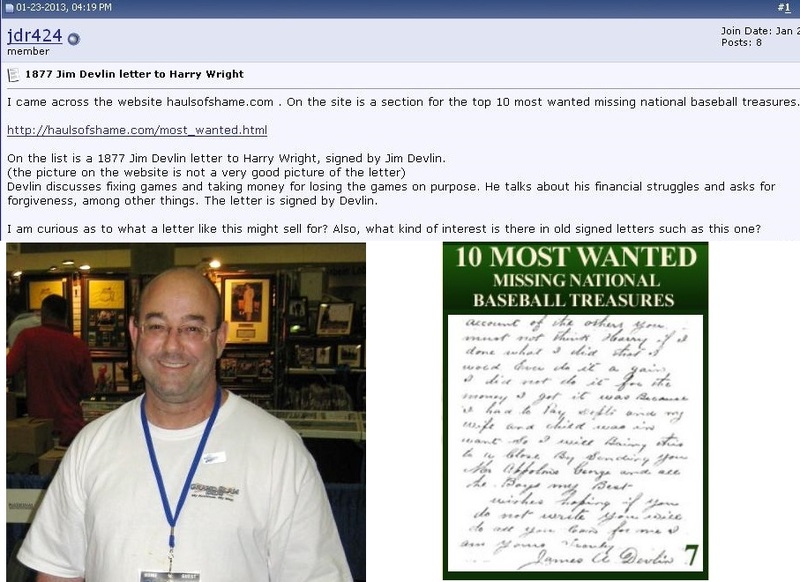 Haulsofshame.com reader Alex R. from Miami suggests that the Commish buy the letter sent by pitcher Jim Devlin to Wright after he was banned for life from Baseball by National League President William Hulbert. Devlin was pegged a cheater after his involvement in a scheme to throw games was uncovered by baseball officials and his pathetic letters to Wright asking for assistance were cited in works published by Dr. Harold Seymour and his wife Dorothy Mills as originating from the NYPL’s Wright Correspondence Collection. 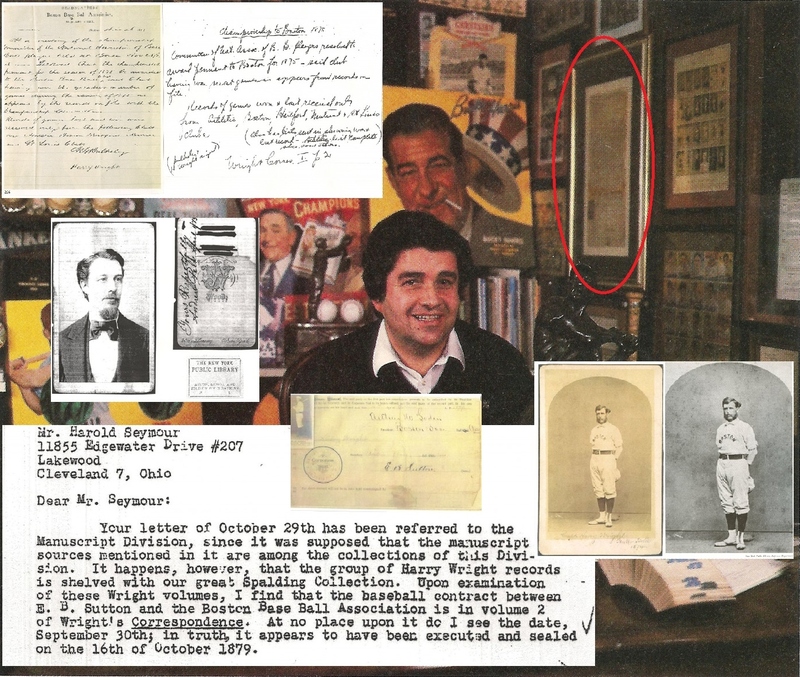 Considering that Harry Wright originally donated his papers and archive to the National League and Organized Baseball in 1895 it would seen appropriate for MLB to step in and assist the NYPL after the FBI returned the stolen cache of letters to the original consignor who placed them in the 2009 MLB FanFest Auction held by Hunt Auctions. 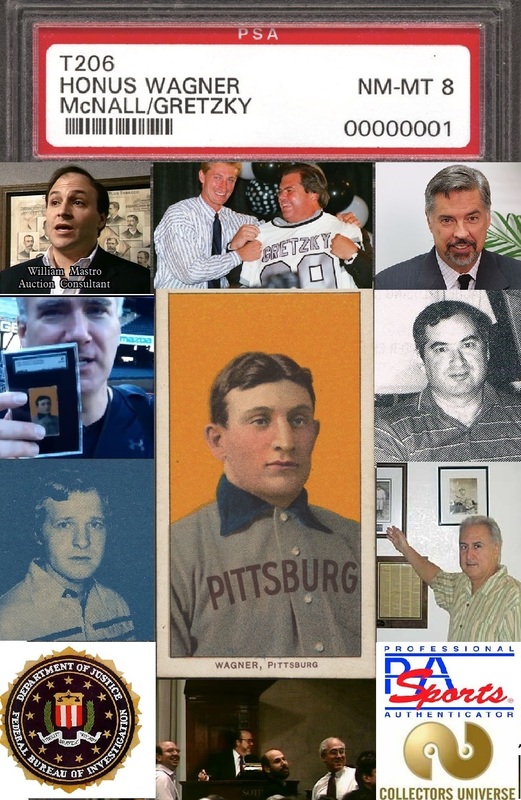 -MLB’s budget for the Alex Rodriguez investigation and for buying the Biogenesis documents and testimony from Tony Bosch (or part of Bud Selig’s $20 million annual salary) could surely cover the costs for these historic Harry Wright documents and save some baseball history. We hear the owner/consignor and the collector who has been buying the stolen documents are open to giving them all back for about $30,000. 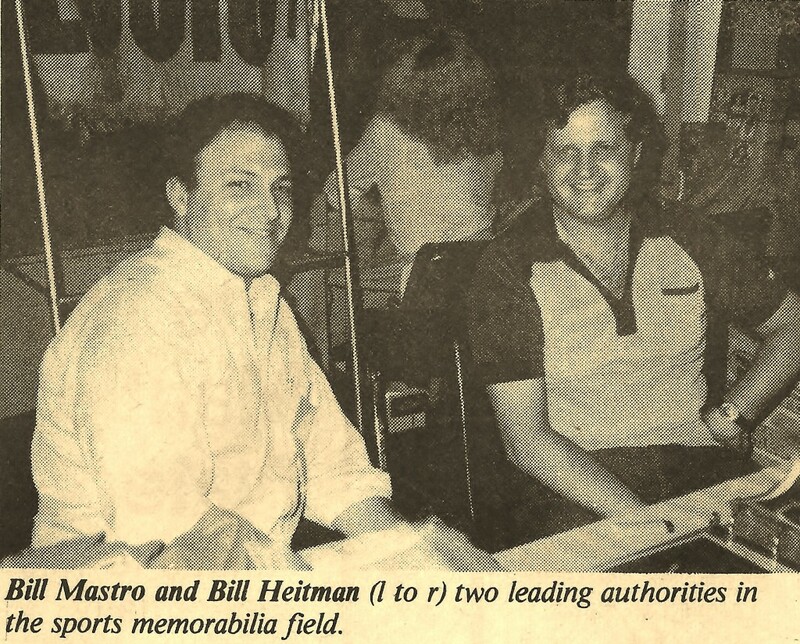 You’d think Selig & Co. could afford that? -Hauls of Shame would like to thank all of our readers for their continued support as our readership has passed 50,000 unique users and close to 150,000 page views per month. 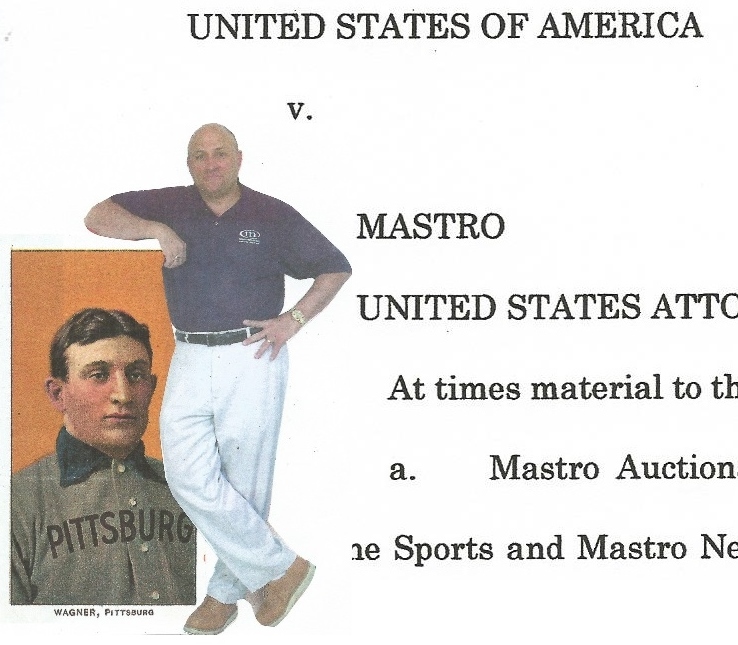 Stay tuned for our soon-to-be-released “Worst 100″ authentications of PSA/DNA and JSA, you won’t want to miss it. 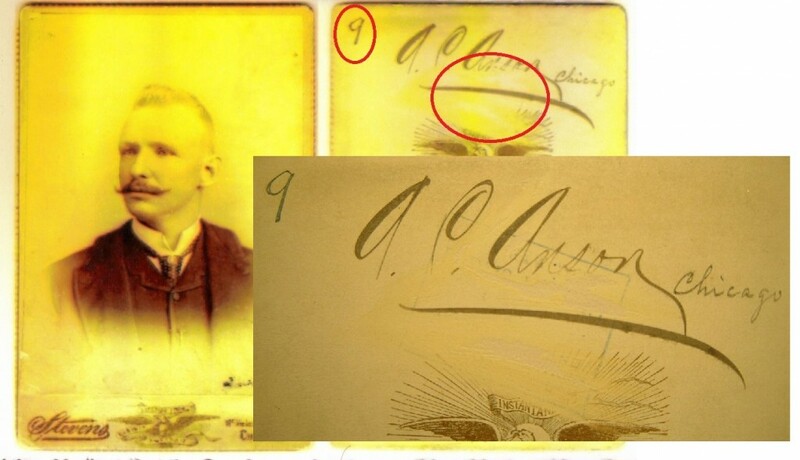 A bogus P. T. Barnum autograph on ebay comes with a PSA/DNA LOA. 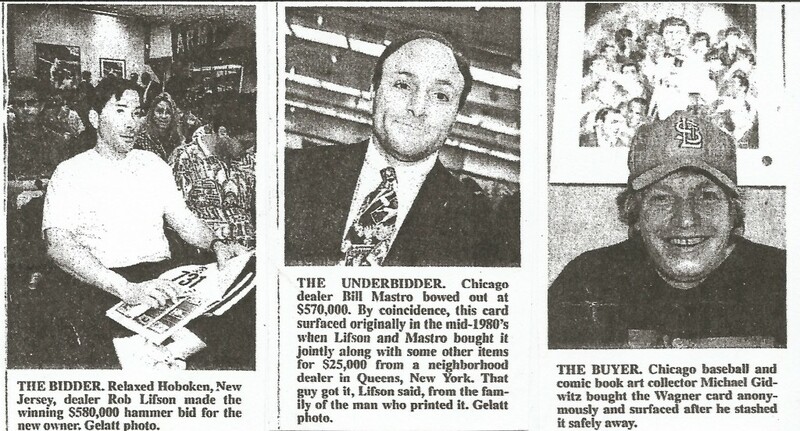 Looks like Joe Orlando has some "suckers" getting cheated. 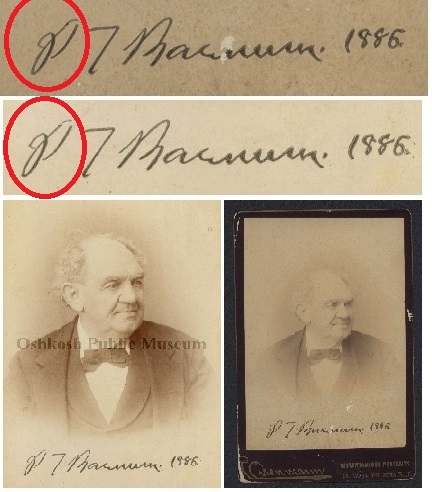 Earlier this week, I stumbled across a PSA/DNA slabbed signature of 19th century entrepreneur P. T. Barnum and wondered if PSA had ever authenticated a bogus Barnum autograph. 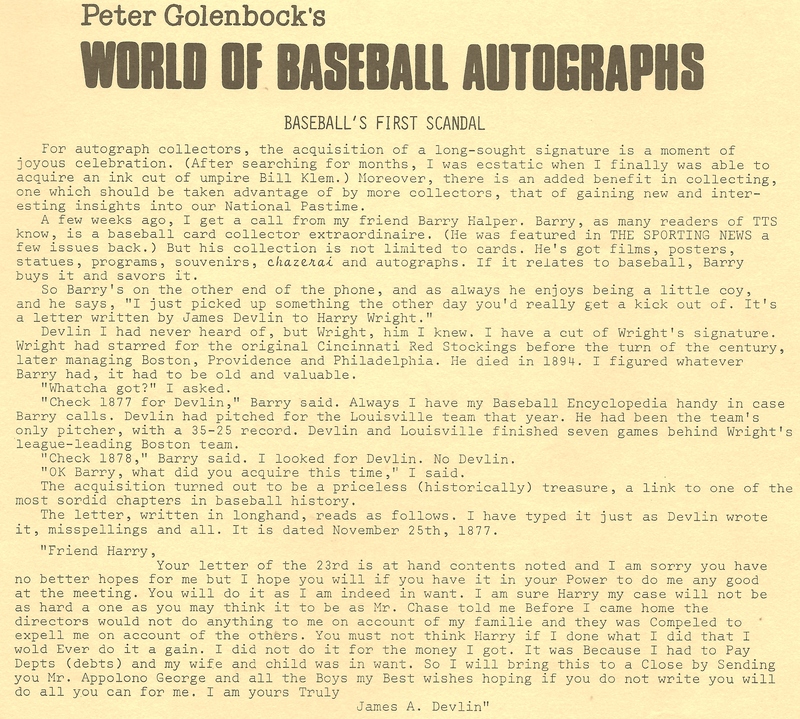 I’m currently putting together an article dedicated to the “100 Worst PSA and JSA Authentications of All-Time” so, I thought the “Sucker born every minute” quote would work well if a PSA or JSA blunder on Barnum had been documented. 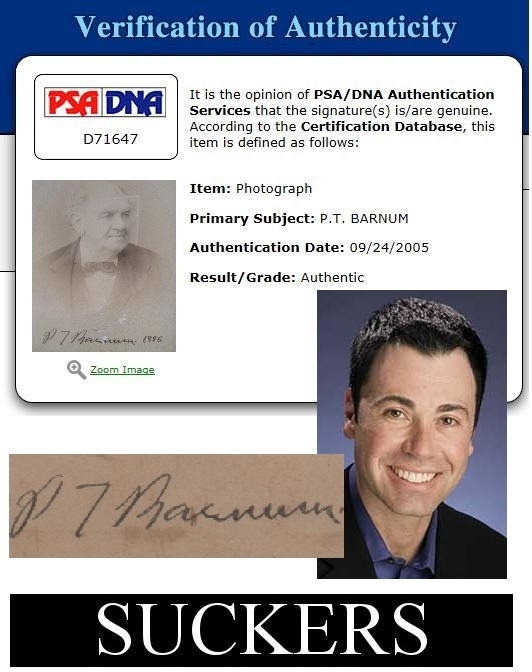 Although it has been documented that Barnum did not actually coin the phrase, “There’s a sucker born every minute,” the gem attributed to him could easily be updated to say: “There’s an eBay or PSA/DNA customer born every minute.” As Koschal has illustrated definitively in his signature studies, the eBay cabinet photo being offered with the PSA/DNA LOA is nothing more than a pre-printed facsimile signature of Barnum embedded in the actual albumen photograph. 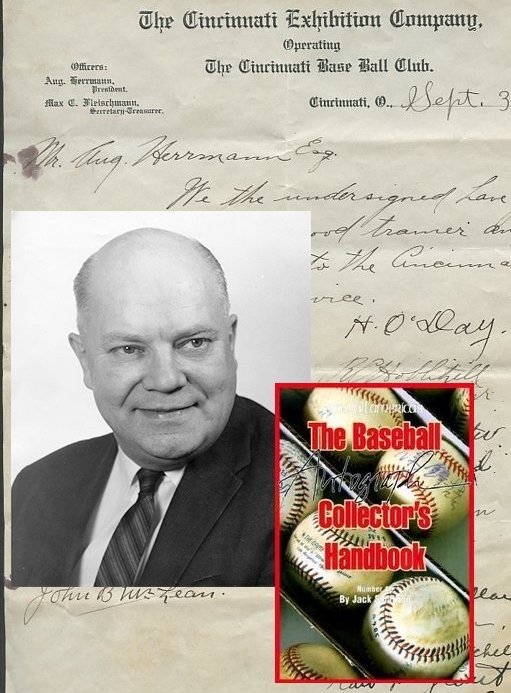 Its a classic Barnum humbug or as baseball historian John Thorn might put it, a “jape” or a “Barnum-esque prank.” It’s a phony and one things for sure: Someone surely did get cheated compliments of Joe Orlando and eBay’s officially endorsed authenticator, PSA/DNA. 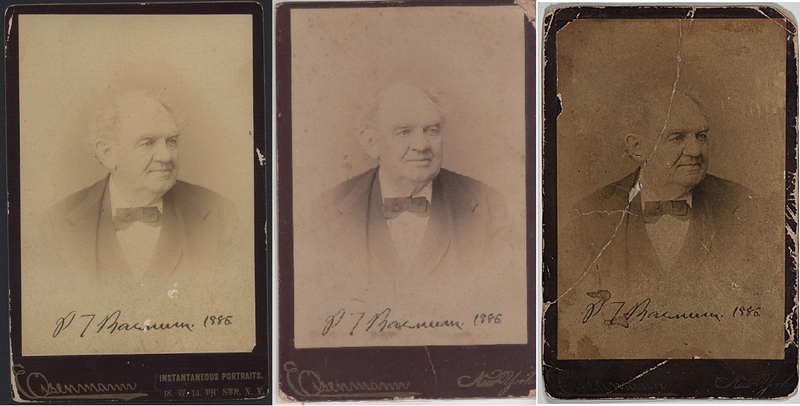 The cabinet photograph currently being offered on eBay by “JustCollect” is one of many similar facsimile signature specimens which were created by a New York photographic studio operated by Charles Eisenmann. 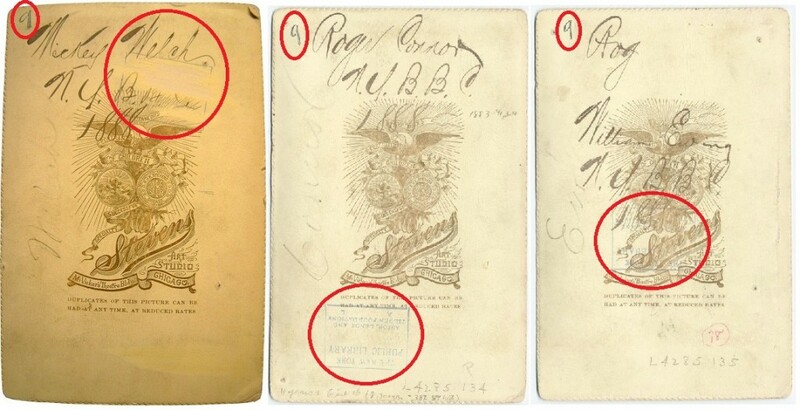 According to Steven Koschal, who has written several articles on the subject in international autograph publications, there are several poses of Barnum which feature different versions of his facsimile autograph with dates from 1885 and 1886. 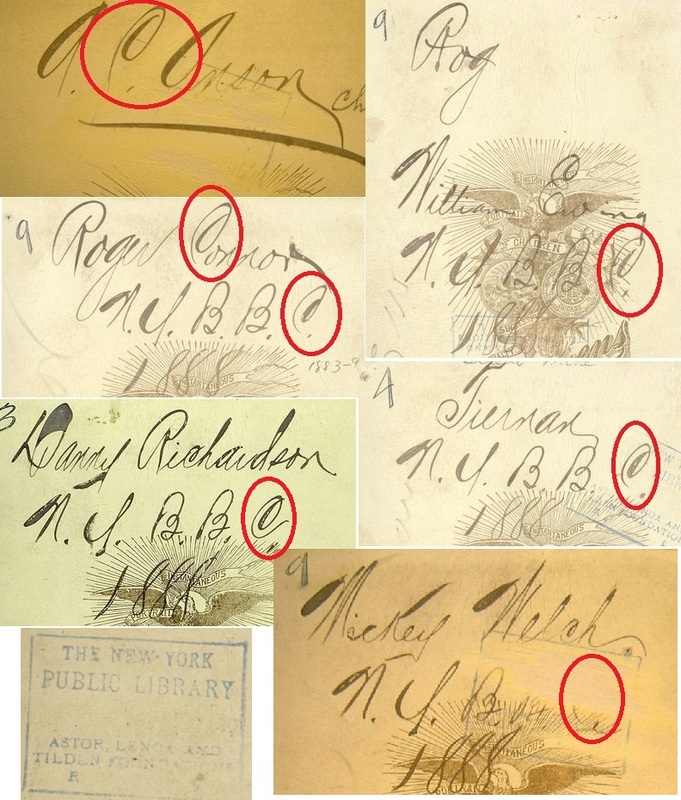 The autographs and the dates are identical depending on which version you are presented with and fluctuations exist only in the resolution or quality of the albumen photos created by the photographic studio. 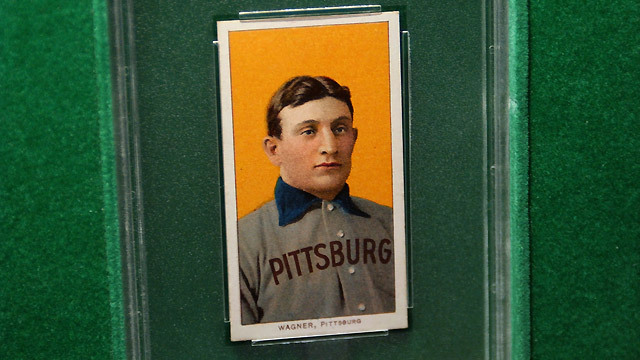 The current eBay offering (left) matches other examples sold at eBay in June (center) and Cowans Auctions (right). 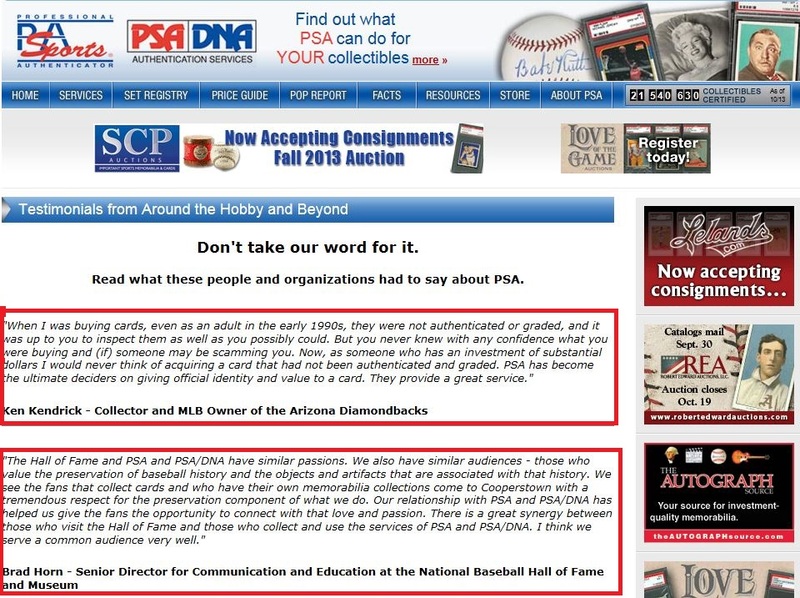 It appears that several auction houses have figured this out without using the services of a third-party authentication company like PSA. 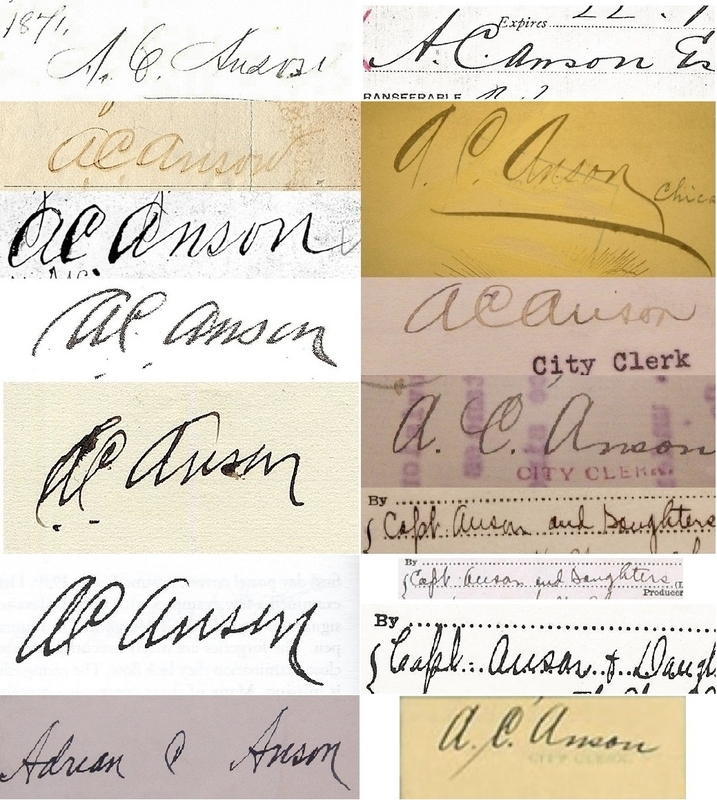 Wes Cowan, of Cowan’s Auctions offered an 1886 example and described it clearly as a facsimile signature. 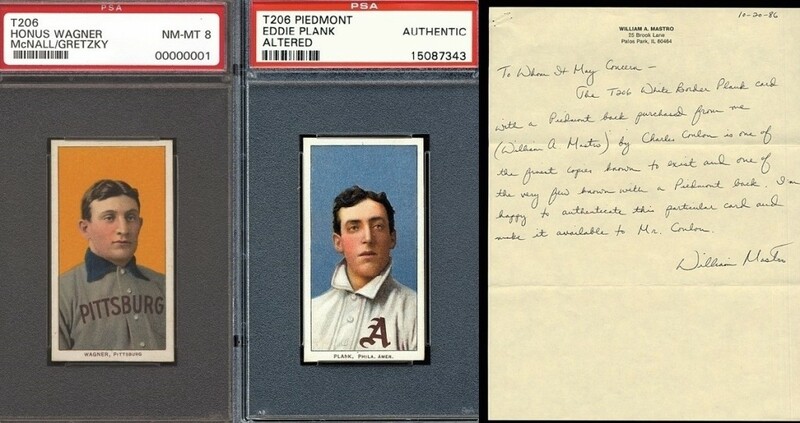 Even R&R Auctions, which is owned by PSA authenticator Bob Eaton, got it right when they offered another example identified as being a pre-printed signature in the photo. 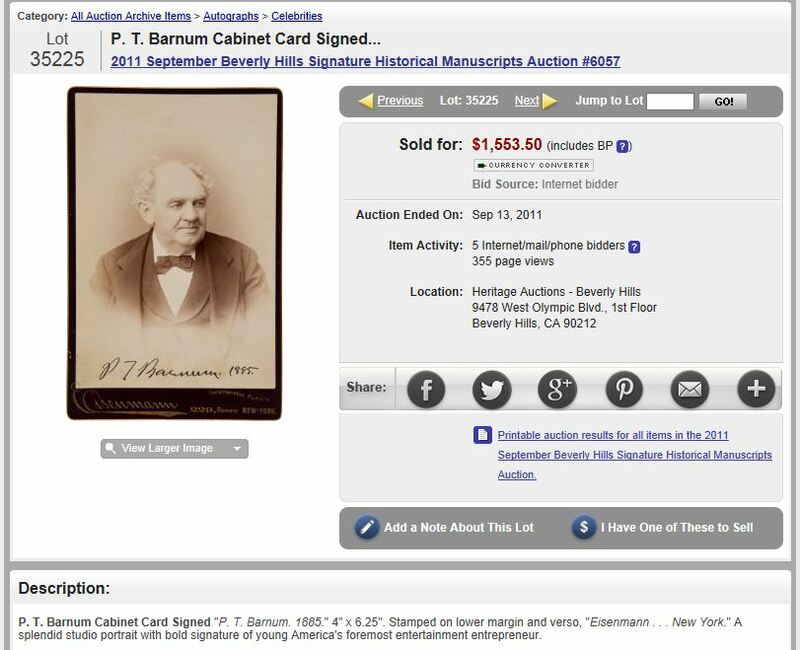 That Barnum facsimile signature sold for $160. 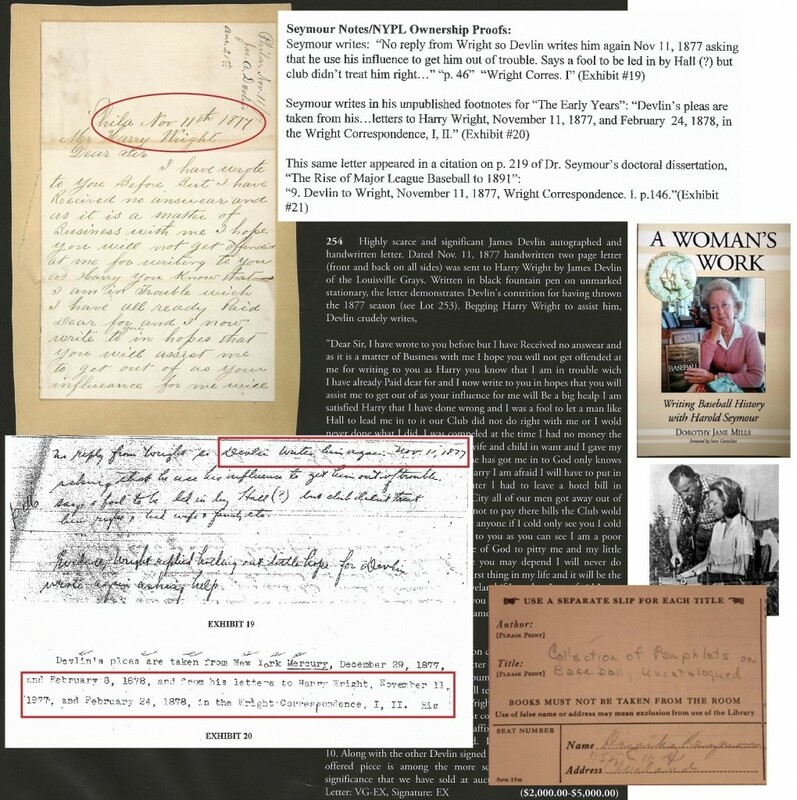 A similar cabinet photo in the collection of the Oshkosh Public Museum (bottom left) has the identical facsimile signature (bottom top) of Barnum as the eBay offering (bottom right and top). The "P" in both versions (highlighted in the red circles) exhibits the exact same skip of the pen found on the original prototype signature used by the photographer. Eaton’s own facsimile signature, however, also appears on the 2005 PSA/DNA LOA certifying as authentic the Barnum signature currently being offered on eBay. 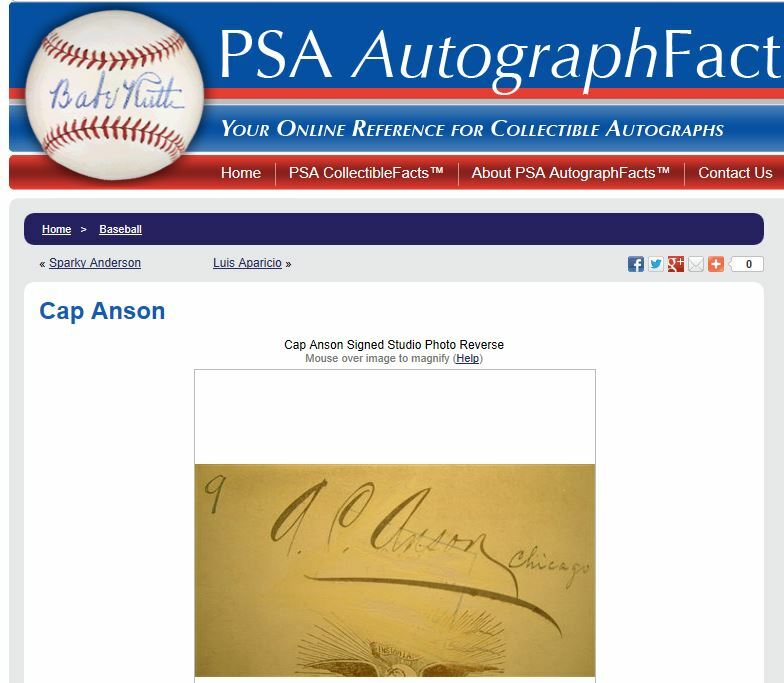 Eaton’s signature appears along with the signatures of Steve Grad, Mike Gutierrez, Roger Epperson, Zach Rullo and John Reznikoff, PSA’s authenticator for historical material. 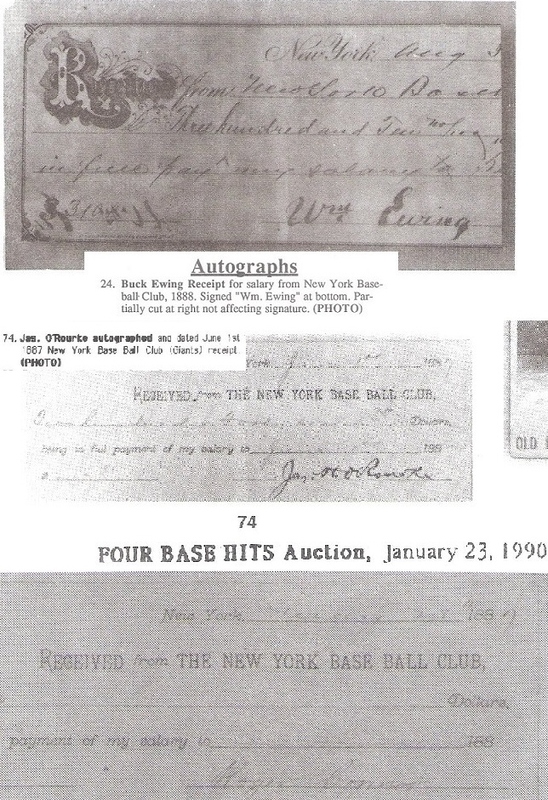 Without the aid of the TPA’s, other sellers and auctioneers have sold the same facsimile signatures as the real deal for the past few decades including several sold recently by Heritage Auctions and others sold by EAC Gallery, Signature House, Goldberg Auctions, EAH Auctions and Donald Steinitz Autographs. 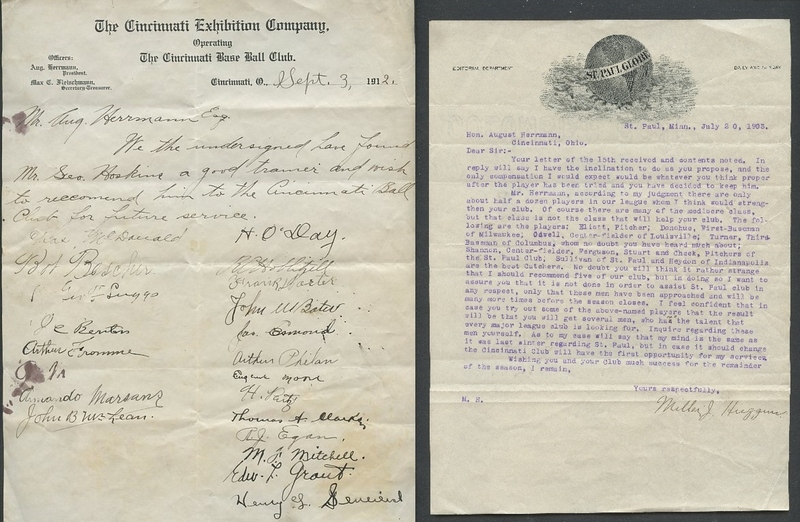 The Barnum cabinet currently being sold on eBay was also previously sold by Lelands as an authentic signature even before it had a PSA LOA. 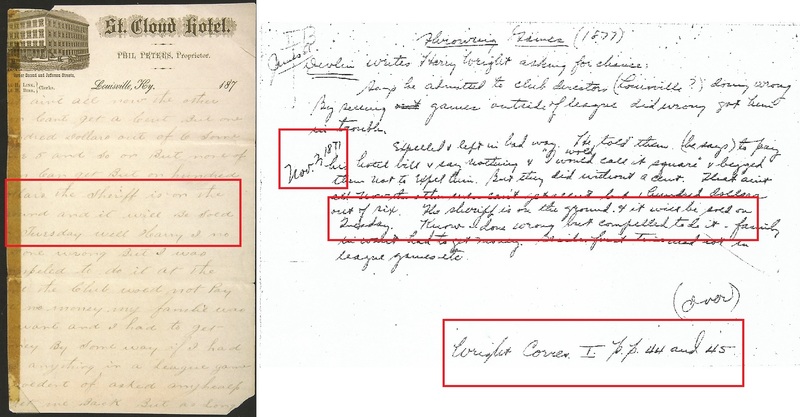 Joe Orlando's PSA/DNA LOA notes examination of pen pressure and other characteristics of an "authentic signature." In 2003 Cowans Auctions correctly offered this Barnum cabinet dated in 1885 as a pre-printed facsimile. 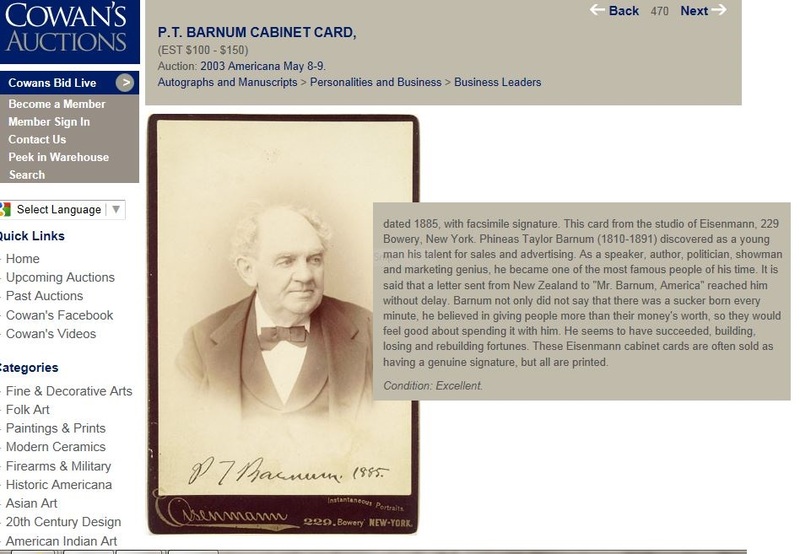 In 2011, the exact same Barnum cabinet previously sold at Cowans as a facsimile was sold by Heritage Auction Galleries as an authentic Barnum signature. 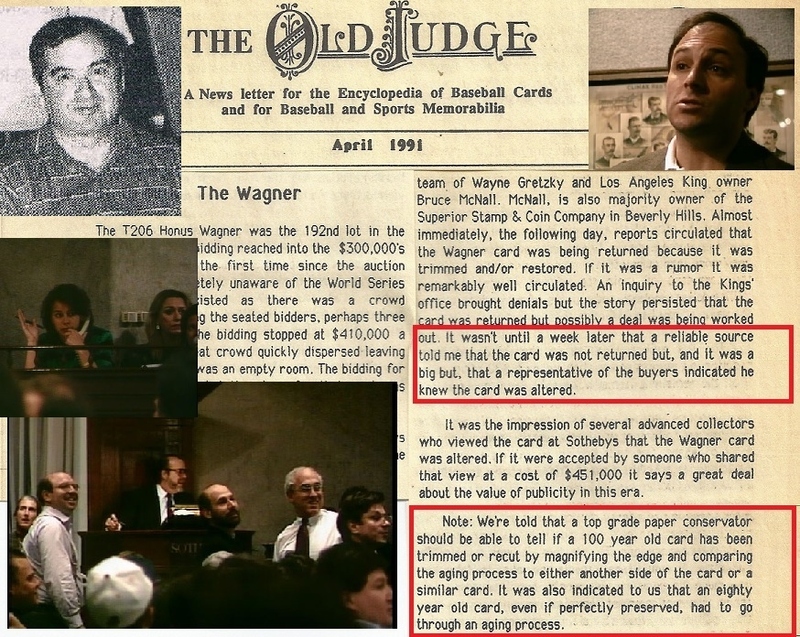 The Cowan’s to Heritage transformation illustrates how sellers, auctioneers and authenticators fail to examine the items they are presented with and how buyers knowingly attempt to pass off non-genuine items as real with the aid of the TPA’s. 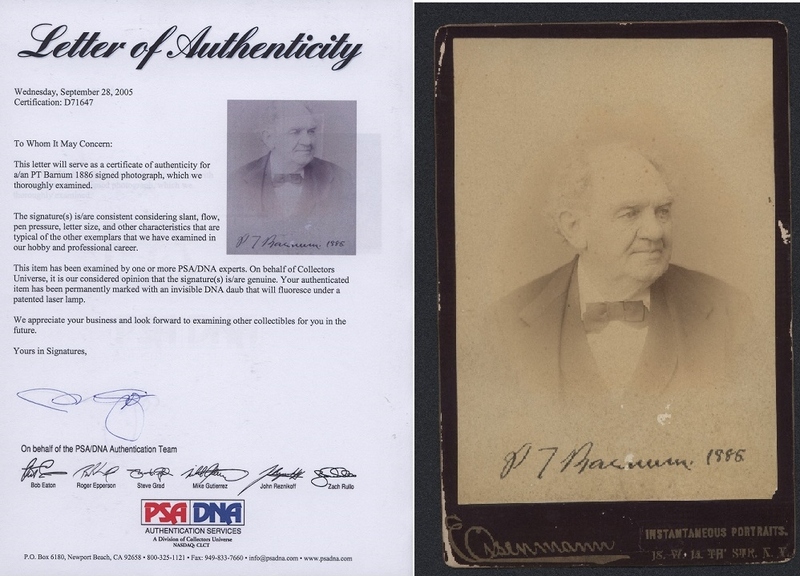 Over the past few decades PSA claims to have authenticated millions of autographed items and with each stunning blunder similar to the “eBay Barnum facsimile” the company continues to lose credibility with thousands of prior authentications coming into question. One hundred of the worst authentications rendered by PSA and JSA will be on public display soon. Stay tuned. P. T. Barnum will surely make the cut.